Film adaptation of David Mamet's comic play Lakeboat about a grad student who takes a summer job on a Great Lakes freighter and sees life through the eyes of his low-brow crew members. A ticket scalper wants to make one last big deal on the pope's visit to finally do something worthwhile about his relationship. A teenage boy in the sixties lives with a foul-mouthed and slightly criminal mother who is having a love affair with her third cousin. I also saw this film at a free screening with a friend. I thought that it had soul. 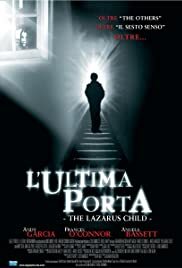 Yes they tried to make it an action film but it still worked....mainly because of some great performances by the boy played by Harry Eden, Alison Heywood played by Frances O'Connor and Elizabeth Chase played by Angelia Bassett. Although the script was flawed and the music was not appropriate the film was a very interesting comment on our relationships with our family and our friends. What would you do if you lost a family member to a coma? I thought that the film looked great as well. The director of photography (Lukas Strebel) did a great job. Basically this was another Ron Bass script that needed some work but was pulled out the "Not great" category by some good directing and strong performances.